Professional Rescue Innovations (PRI) is a small, local, privately owned company that focuses on training rescue personnel for various rescue situations. 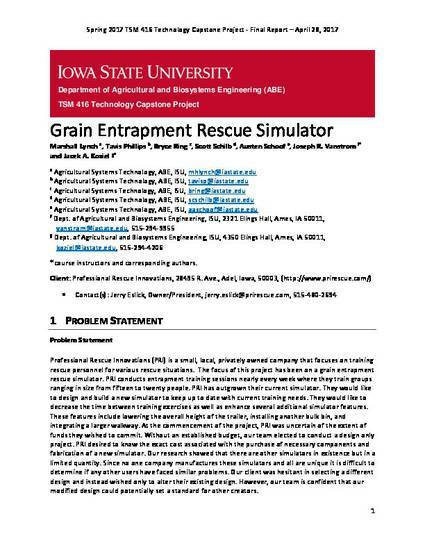 The focus of this project has been on a grain entrapment rescue simulator. PRI conducts entrapment training sessions nearly every week where they train groups ranging in size from fifteen to twenty people. PRI has outgrown their current simulator. They would like to design and build a new simulator to keep up to date with current training needs. They would like to decrease the time between training exercises as well as enhance several additional simulator features. These features include lowering the overall height of the trailer, installing another bulk bin, and integrating a larger walkway. At the commencement of the project, PRI was uncertain of the extent of funds they wished to commit. Without an established budget, our team elected to conduct a design only project. PRI desired to know the exact cost associated with the purchase of necessary components and fabrication of a new simulator. Our research showed that there are other simulators in existence but in a limited quantity. Since no one company manufactures these simulators and all are unique it is difficult to determine if any other users have faced similar problems. Our client was hesitant in selecting a different design and instead wished only to alter their existing design. However, our team is confident that our modified design could potentially set a standard for other creators. Marshall Lynch, Tavis Phillips, Bryce Ring, Scott Schilb, Austen Schoof, Joseph R. Vanstrom and Jacek A. Koziel. Grain Entrapment Rescue Simulator. Final Report. TSM 416 Technology Capstone Project, April 28, 2017.